You are here: Home / Sauces, Gravies & Rubs / “Can” you taste the difference? Homemade Cranberry sauce recipe- from your oven! Is fresh really best when it comes to the cranberry? It is amazing that these tiny tart berries hold such an esteemed place at family tables as we celebrate Thanksgiving. How to prepare the berry is a controversy some families face… though to be honest, when faced with this choice many simply open a can (jellied or whole berry?). For many years, my favorite recipe for cranberries was a fresh relish I tried when a friend had me over to their grandmother’s home for a meal. She said she originally found this recipe on the back of a bag. It consisted of fresh berries, a whole orange (peel and all), and a ton of sugar—all blended together. I loved the refreshing combination of citrus and cranberries and I’ll be the first to admit that it tasted nothing like the canned stuff I normally had at my family gatherings. With my family, cranberries always came in two forms: straight from the can, sliced like butter with our “special” cranberry sauce server OR in one of the molded gelatin options my mother made— normally full of nuts and other fruit. Though both of these served their purpose, they just didn’t cut it for me. The canned option tasted too much like the interior of a can. The texture of the other option frightened me a little…though I like nuts, crunchy cranberry sauce was just a little too weird for me. I thought the cranberry orange relish was pretty close to perfect. Evidently not everyone shared my passion for its “zestiness” so back to menu planning I went. I sought a cranberry option that would really please a crowd. Yes, I could make a simple simmered cranberry sauce. But the thought of standing by a saucepan, stirring, and stirring, and stirrings, and stirring—you get my point. 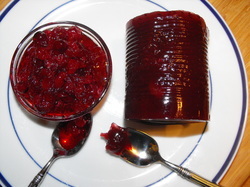 I was thrilled to stumble across the idea of oven cranberry sauce. If you can roast a turkey, can you roast a cranberry too? It sounded to easy to be true. It was worth trying. As I measured out the TWO ingredients required to make this simple dish I wondered…would my kids eat it? Cranberries, after all, are famous for their unique combination of both bitter and sour. 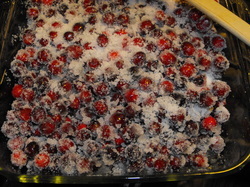 Three cups of cranberries and half as much sugar were measured into a 9” square glass baking dish to cook at 350°F until syrupy and thick. Initially the dry berries and dry sugar looked a little hopeless. But as the first 15 minutes passes and I pulled the dish out to give them a stir, I realized that the magic was starting to happen. The bright red juice was barely dripping from a few of the berries, but after 15 more minutes the berries were floating in a pool of juice. As this sweet colorful syrup cooled and thickened, I opened a can of whole berry sauce and decided to do a taste test with my family. I tried both and I am pleased to say that the homemade sauce did taste subtly “fresh-er”. I was worried that it would be too sweet or not sweet enough but it was perfect. There were just enough whole berries left to make it beautiful—without too many risky explosions. Then there was my eight-year-old son. The results were the same. To my surprise, at dinner both kids, who would not normally even consider cranberry sauce an option at a family holiday buffet, were gobbling down small bowls full of it. Wow! Originally posted November 2010—but still a Thanksgiving favorite!